Yaroslavl Shipyard pulled the stocks of sea rescue tug project 745MBS (serial number 444) for the Ministry of Defense. 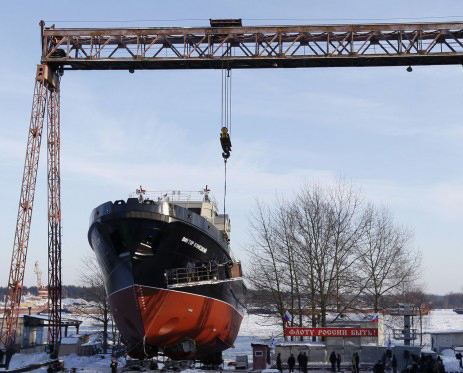 On creation took about a year, and the Yaroslavl shipbuilders working ahead of schedule. The new ship was named "Victor Kopecky" — in honor of the sailor and the famous Romantic writer, author of sea novels and short stories. Captain Victor Kopecky has worked for more than 30 years in the merchant navy, and before that served as a navigator on board the rescue service of the Northern Fleet. His account — Hundreds of lives saved. And many will remember the literary gift. In his scenario filmed "Striped flight" and the "path to the pier." On the descent of the vessel arrived from the northern capital and the widow of Victor Koneckogo Tatyana V..
— Dear Yaroslavl! We are happy that the vessel will be withluzhit the Baltic Fleet — appealed to the audience Tatyana V.. — Perhaps the most often and especially In recent years, Victor recalled his service in the 441-m separate division of emergency service of the Northern Fleet. Me and hard, and to think well of that "Victor Kopecky" again goes to the rescue. Let this ship will be less work … Thank you for the wonderful work of Yaroslavl. By tradition, the ship was consecrated. For such an important cause and took himself Metropolitan Panteleimon of Yaroslavl and Rostov. — This beautiful vessel is a sign of your devotion to his work — said the Bishop. — Today we dedicated the ship, which will serve as a good cause — the rescue. And the gift of the lord of the customer handed over the icon of St. Nicholas, which will protect the ship in the naval campaigns. "It is equipped with modern facilities. It will be remotely operated underwater vehicle. Designed for rescue, fire suppression system is a powerful" Wai Fai-2. 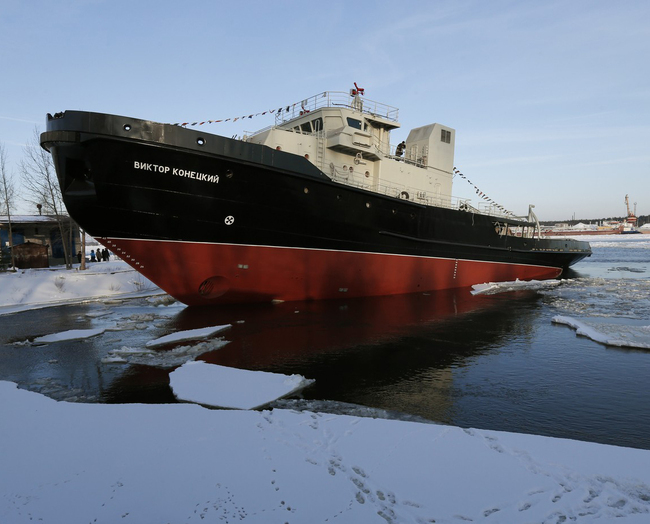 "This is a modern equipment," — said General Director of Yaroslavl Shipyard Svetlana Chekalova. — Putting out fires on shore facilities. — To move in waves of more than 5 points on the course by maneuvering a corner and changing speed. Pull on the hook tug at normal displacement and ground speed of 6 knots in deep water and rough seas up to 3 points is not less than 230 kN.